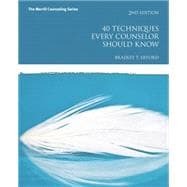 User friendly, concise, and thorough, Bradley Erford’s 40 Techniques Every Counselor Should Know gives students a succinct look at the theoretical basis underlying each of 40 counseling techniques, and the common variations that can be used to ensure their successful implementation. The book identifies techniques from diverse theoretical approaches, including: Brief Counseling; Adlerian or Psychodynamic, Gestalt; Mindfulness; humanistic-phenomenological; Social Learning; Cognitive; Behavioral; and Cognitive-behavioral. Transcripts and descriptions show step-by-step how to implement the techniques, outcome research on each technique helps in determining which techniques are best for use with various populations, and multicultural implications help readers learn more about applying each technique and approach to counseling clients from diverse cultures. Added to this new edition are: new chapters on Journaling, Miller and Rollnick’s motivational interviewing, self-disclosure, empathic confrontation, and strength bombardment; new sections on mindfulness-based procedures and humanistic-phenomenological approach to counseling; a number of new, edited, or expanded transcripts; and; thorough updating of sources throughout.